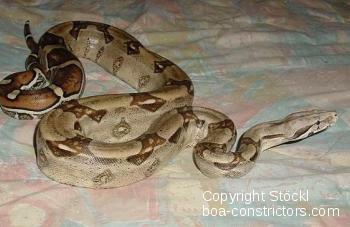 Venezuela is rich on different variations of Boa constrictor. This country seems to be a treasure chamber for the Boa constrictor enthusiast. 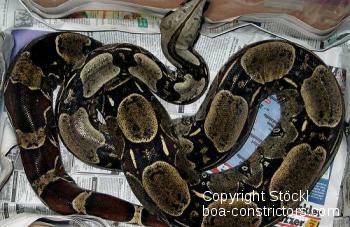 Unfortunately, the Venezuelan law strictly prohibits the export of Boa constrictor. Therefore Venezuelan Boa constrictors are hardly available. The most beautiful Boa c. constrictor with dark-red tails and black saddle pattern are found in two different areas (45 miles south and the other 65 miles west of Caracas). Both regions are about 0 - 100 m above sea level. It's a tropical climate with less variation between daytime and nighttime temperature. The boa enthusiasts in Caracas/Venezuela are lucky guys. 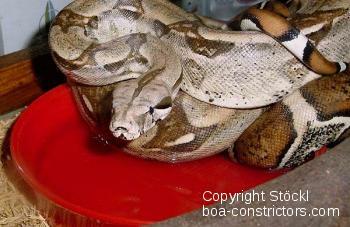 They find Venezuelan redtail boas in their gardens or in the courtyards of their houses. Caracas is about 1000m above sea level. The night temperatures sometimes drop to 54 degrees Fahrenheit (12° C). During the day the temperatures are 77 - 86 degrees Fahrenheit (25 - 30° C). The day temperatures are relatively constant all year. Unfortunately, many of the natives in Venezuela kill snakes whenever they see one. They do not appreciate the wealth of reptiles in their country. 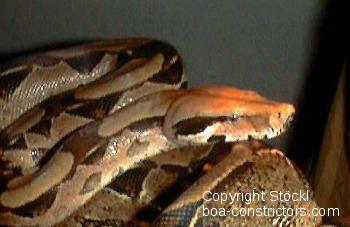 In Venezuela, the distribution areas of Boa c. constrictor and Boa c. imperator overlaps. In these regions, naturally evolved intergrades between both subspecies occur. The animals above appear to be such intergrades. The beauty of the redtails is melted with the hardy nature of the imperators. However, this should not be a permit for crossbreeding. These crossbreeds are legalized by mother nature. How do you recognize a crossbreed? Reliability in purebred boas from the U.S.? Already extinct on the islands of the Taboga complex!